I’m back on the vise, after 6 months of steelhead flies, back to the big flies that can be used for trout, smallmouth, pike and muskie. Had the last few days off and playing around with a few new patterns. Working on dialing the weight so that the patterns will swim correctly. While most of my water is still frozen (the northern Michigan inland lakes), getting a few patterns wet in the bath tub helps. Picture above is the seeing eye rattle weight , curious what this guy does. While most patterns that incorporate rattles have them lying parallel to the shank, thought I would try a little perpendicular , allowing the rattles to tumble from side to side. Now will this cause the fly to walk the dog more? 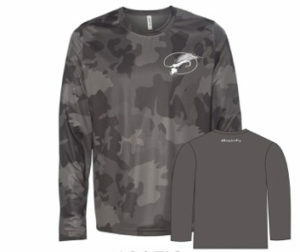 Can’t really tell until you get out on the water and throw it with the sink tips and floating lines. But the creative juices are once again flowing, and for the guys who have been checking out the site. I’m sorry for the lack of content. Promise to kick it up a notch for a while. Thank you again. These flying fish have me inspired to work on a new fly pattern and retrieve, defiantly two handed retiree to the match speed needed, and just need to figure out how to cast a fly that has wings. No mater this is a cool little video. Excited to announce that 2018 I’ll have a new drift boat in the arsenal, working with Jason and Tracy I’ll be rowing a Huron Drifter this year. I want to share a few pictures during the process as its being built. But if your looking for a new drift boat make sure to give the guys a call. During the test row last summer I was very impressed, and look forward to putting more time in the rowers seat in the coming months. 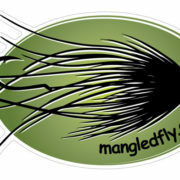 Will have a few custom touches that I’m excited about, especially for the dry fly angler. Follow along as the new 15″ Huron Drifter is being built. With it being streamer tying season we have a new video on our Vimeo page to share. 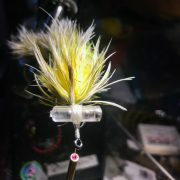 Russ Maddin shares another streamer that is a must tie. Using Egg Yarn for the head gives this Maddin creation great action. 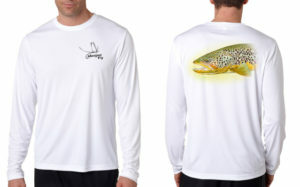 Add a few of his techniques to your box and have a great trout season. Make sure to watch until the end, as Russ breaks down what line and leader setup to use when fishing this great fly. I just wanted to share my personal experiences with two of Scott’s flagship two handed rods, the Radian 1257 and the Radian 1259. A while back, we reviewed the 1308 Radian, and were very pleased with it as a great big river rod. The Radian 1257 is a 12’6″ 7 weight rod. Many of the 7 weight two handed rods that you might cast that are on the light side. You would not consider them as a primary rod for big rivers like the Muskegon or the Manistee. However, the 1257 has some nice horsepower, and can elegantly cast a 480 grain skagit head with 8-10 feet of t14 (Note that the recommended Skagit with this rod is 520 but given the tips I use, I prefer 480). This will cover a lot of the scenarios encountered on our river systems. Because of its light weight and sensitivity, I find myself using this rod to fish the edges of the river in the winter months. Fishing in the winter in this manner requires a rod with a lot of tactile feel because you are mending the line, allowing the fly to get to the bottom, and then engaging it. In a nutshell, this rod is very sensitive and is a pleasure to use for this purpose. 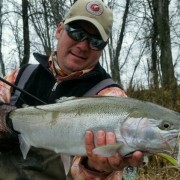 Furthermore, because the edges of the river often contain trout as well as steelhead, using the lighter rod keeps things fun for me and my clients. This rod is capable of long casts, but I find myself using it in close. When fighting a fish, it protects tippets well. Though I have only used it for swinging, I could see this as a good indicator rod. 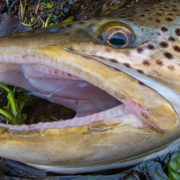 If you do not want the added weight of an 8 or 9 weight, this 7 weight can handle most situations you will encounter on medium to large rivers in the Great Lakes region. It is a very sweet rod indeed. Now let’s talk about the Radian 1259. As you can imagine, it is a totally different beast than the 1257. This rod is very stiff and very powerful. This is a new rod in Scott’s Radian lineup, and as such, I have been using it for a couple of months. During those months, I have put it through its paces. For my purposes, this rod is best for down and dirty fishing at short to medium range. This is not a rod for everyone, and does not have the agile feeling of the 1257 or the 1308 Radian. Typically, I use this rod with a 560 or 600 grain Freightliner Intermediate Skagit, and a significant amount of T14 or a short and compressed head of T17 or T20. 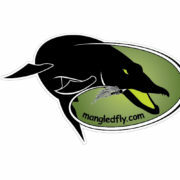 In this configuration, it makes easy work of casting a heavy line with a heavy fly. If I had to point out one drawback of this rod, it does not inspire as much confidence when fighting a quick moving steelhead. The rod is very stiff and those panicked head shakes are nerve wracking with this stick. 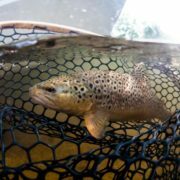 I see the best applications of this rod as specialty rod for big fish, big tips, heavy tippet, and big flies in relatively close quarters–steelhead in timber or big king salmon in coastal regions come to mind. For these applications, this rod is a gem. I could also see an application for this in surf fishing as it could shoot line well into wind and waves. I hope you enjoyed this review. If you have any questions about Scott rods, please contact Scott pro staffers Kevin Feenstra or Jon Ray. Thank you for reading! Tight Lines! 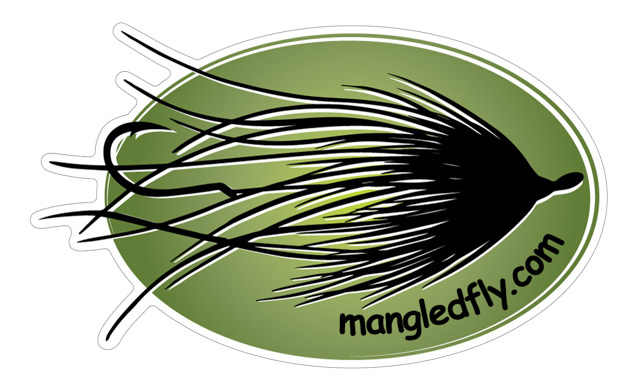 Mangled Fly will be taking over the Social Media Feed for Scientific Anglers Instagram feed make sure to check it out and give us a few likes. Thank you for the opportunity SA! I’ll embed a few of the images during the week here so make sure to check back and follow as well if your not on Instagram.